Synopsis (from GR): This is a world divided by blood – red or silver. The poverty-stricken Reds are commoners, living in the shadow of the Silvers, elite warriors with god-like powers. To Mare Barrow, a 17-year-old Red girl from the Stilts, it looks like nothing will ever change. Then Mare finds herself working at the Silver palace, in the midst of those she hates the most. She quickly discovers that, despite her red blood, she possesses a deadly power of her own. One that threatens to destroy Silver control. My thoughts: Sometimes you've just got to ignore the (perfectly valid) criticisms of a book and go with your gut - and this is one of those times. 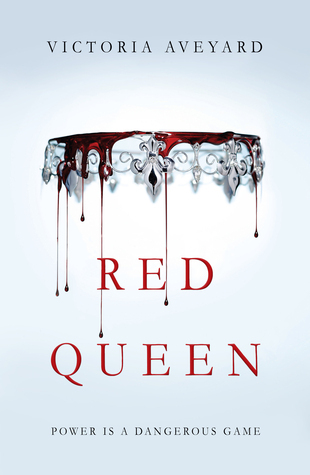 I really, really enjoyed Red Queen. It was an enjoyable read, and did a good job of setting the tone for the next two novels. Although everything about this book was screaming, "Love me, Kim, LOVE ME!!!" I went into it with a few reservations, if only because there were less-than-favourable reviews from bloggers that I respect and usually agree with, but while I can see where they were coming from, it didn't stop my overall enjoyment of the book. Mare Barrow lives in a society that is divided into two classes - the Silvers, those with silverblood who wield extraordinary powers and are the ruling class, and the Reds, who basically get the short stick in life because of the colour of their blood. As a Red, Mare is born into poverty and struggles to survive. Without any skills or useful talents - aside from her ability to pickpocket - Mare knows she will be conscripted into the army on her 18th birthday and most probably die a prolonged and painful death. One night, Mare meets a mysterious stranger who arranges a job for her at the palace. This mysterious stranger happens to be Cal, the Silver prince who is about to be married off to whomever his father and stepmother decide they like best, and it is during this pageantry of princess hopefuls that Mare accidentally demonstrates that she, too, possess powers - the ability to create lightning, an impossibility amongst both Reds and Silvers. The King and Queen tell the Silvers that Mare is a long-lost Silver girl - Mareen Titanos - who was taken in by a Red family. She had no idea that she was truly a Silver, until the display at the Queenstrial. This admittedly kind of threw me - the Silvers are so named because they literally have silver blood, and Reds, red blood. Am I to believe that the King and Queen convinced people that Mare had never bled in her life? A lot of reviews have cast Mare as some Katniss Everdeen-type heroine, but I didn't see that. Like Katniss, she does care deeply for her loved ones and would do anything to protect them; like Katniss, she lives in poverty at the hands of a higher ruling class; like Katniss, she is frustrated and disgusted by the people she meets in that higher class and the attitude that they have towards her own. But Mare isn't coldly pragmatic like Katniss is - she allows her emotions to cloud her judgement. Mare comes across as selfish and bratty at times, and at times was just plain frustrating. A lot of people - innocent people - get harmed as a result, and to be honest? It made it hard to get behind Mare and her cause. Mare also doesn't listen to the advice she is given. It's a fairly simple piece of advice - anyone can betray anyone. You would think this would mean Mare carefully navigates the world she's been thrown into, but she falls for the villain's story, hook, line and sinker (admittedly - SO DID I. Did not see it coming, at all). Another problem I had with Red Queen is the mean girl antics. Evangeline Samos and Queen Elara become cardboard cutouts - they exist to be cruel and to be an obstacle in Mare's journey. I know Evangeline likes torturing people and cares deeply for her brother, Ptolemus. I know Elara likes torturing people and cares deeply for her son, Maven. I don't know anything else about these characters. They are mean for the sake of being mean. I like my villains to have a backstory, for me to understand how they came to be that person. No one is Lord Voldemort - we all have shades of grey. No one is completely good or completely evil, and even though this story is being told from Mare's perspective, I wanted more. This wasn't a problem that was limited to Evangeline and Elara - a lot of the female Silvers we met were evil, unnecessarily so. There's kind of a love... square happening in this book, but it's like every love interest has a purpose. It's strategic. In a book where characters manipulate one another for their own gain, it made sense. Mare may be betrothed to Maven, but she's in love with Cal and Kilorn's most probably in love with her but Mare doesn't know. I will say this: if the endgame is for Mare to be Queen, then Mare is going to have a lot of growing up to do. She's reckless and rash, and while she wants the best for her people, she goes about it the wrong way. The execution of Red Queen may not have been perfect, but it was still an enjoyable read. While there are a lot of common YA tropes in there, what makes it stand out is the (mutant) powers of the Silvers and the political plays. Aveyard is a solid writer, and I cannot wait for the next book in the trilogy.